SFR 100 has been the flagship of SFR products as the leader in extreme pressure oil fortifiers. SFR 100 has been tested more than any other additive on the market with warranty approved engine tests as well as extensive industrial testing. Literally millions of users around the world have validated this exciting technology. SFR 100 Oil Fortifier is a composite of super-concentrated additives that dramatically increase the effectiveness and durability of lubricants in automotive and industrial applications. Used in combination with your present lubricating fluids it significantly reduces friction, harmful deposits, corrosion and parts wear resulting in the extension of equipment and lubricant life in addition to improved operating efficiency and power. 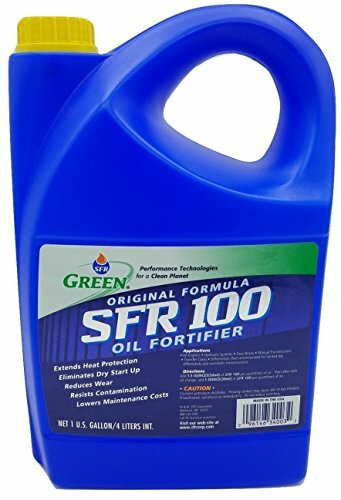 SFR 100 is the original SFR oil fortifier developed in 1988 as the only fully fortified product on the market. Based on extreme pressure agents as its main technology, SFR actually contains many more additives to improve a lubricants performance. These include detergents, dispersants, anti-oxidants, anti-wear agents, acid neutralizers, corrosion inhibitors, and as noted extreme pressure agents. SFR 100 is petroleum based and developed for a wide variety of applications. It can be used in engines, hydraulics, gear-boxes, differentials, transfer cases, compressors and most anywhere lubricants are used. This technology has more testing than any other product that we have ever produced, not counting the millions of satisfied users. SFR 100 is not recommended for automatic transmissions that rely on friction, and can be used in limited amounts in hydrostatic drives as well as limited-slip differentials. Due to the high zinc content this product is not recommended for vehicles manufactured after 2006. SFR 100 has been proven over many years by millions of users. If you have any questions about this product by SFR, contact us by completing and submitting the form below. If you are looking for a specif part number, please include it with your message.